Will I quit with the pumpkin recipes, already??? No, no I will not. Okay. I will. But just give me this one last one…. My son has discovered scones. He loves them because he can get up in the morning and “make” his own breakfast, meaning, he goes to the counter and opens up the tupperware with the scones in it and grabs one while I’m still asleep. I’m of the opinion that I need to encourage this kind of independence. So, yeah, I’m on pumpkin kick. The Whoopie Pies were a big hit, and I still had pumpkin left in the can, so I thought…. 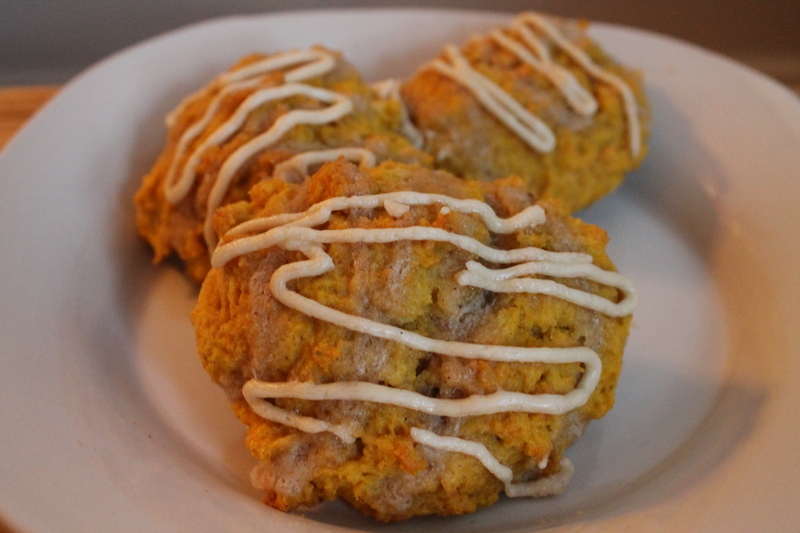 pumpkin scones! I made scones a couple of months ago, and I did the whole thing where I rolled them out and cut them into triangles. I have clearly become even more lazy since then, because with this recipe, not only did I make the entire thing in the food processor, but I merely dropped the dough by big spoonfuls onto the baking sheet, and made them freefrom. I had some icing still left over from the whoopie pies, so I drizzled them with that, and voilà! Easy, peasy, lemon squeezie. In the bowl of a your food processor, combine the flour, sugar, baking powder, salt, cinnamon, nutmeg, cloves, and ginger. Pulse to combine. With the motor running, add the butter one chunk at a time through the chute. Continue processing until it has a grainy, pea-like consistency. 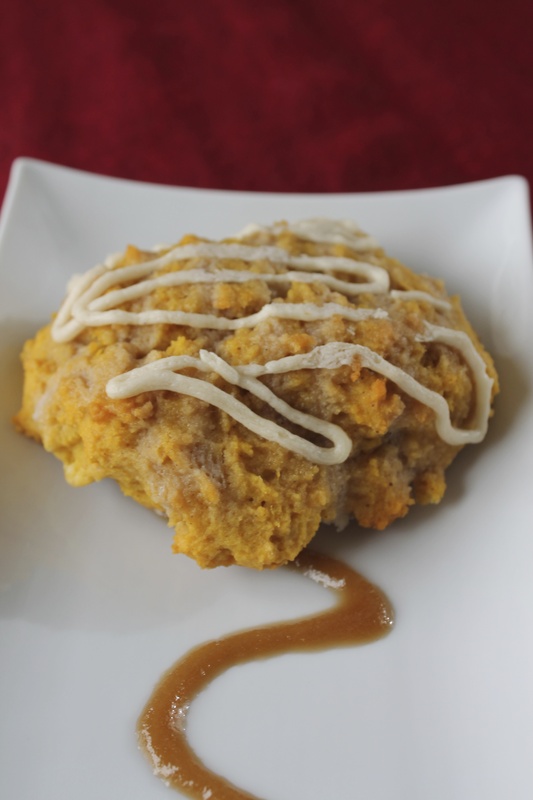 In a separate bowl, whisk together pumpkin puree, half & half, or milk and egg. Add to flour mixture and pulse until just combined. Drop by large spoonfuls onto a parchment-lined baking sheet. Bake at 425 for about 15 minutes, or until golden. Allow to cool, and then drizzle with Maple Caramel Icing. Given my not-so-secret coffee addiction, and the fact that I am running a business and raising a boy on little sleep, its probably safe to say, we spend some time at Starbucks. I don’t always feel good about it–I do prefer to support local, small, family-run businesses if possible, but dang! those things are on every street corner in Vancouver, and they are convenient. So, yes, we sometimes end up at Starbucks. Coffee for me, milk for the sprout, and usually, a Petite Vanilla Bean Scone, which he loves. 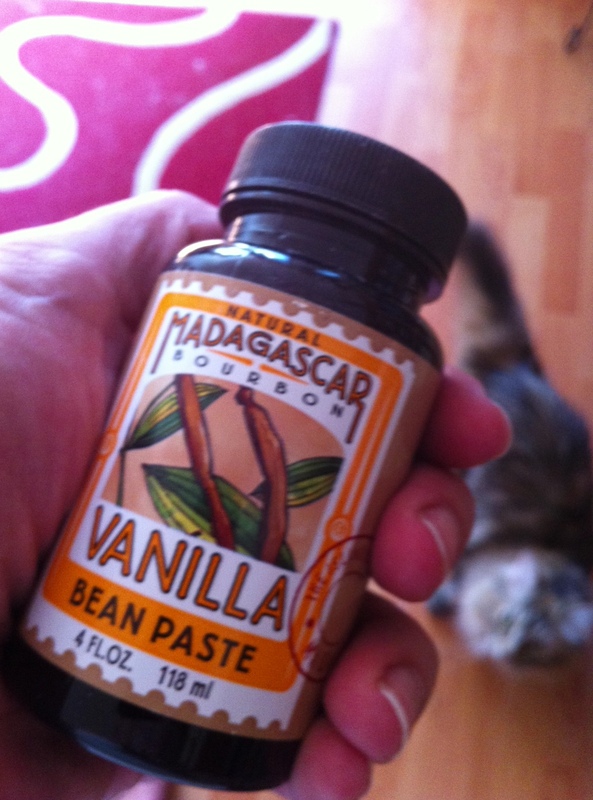 I recently discovered something called Vanilla Bean Paste. Now, a couple years back, I made the switch from artificial vanilla to the real stuff, and there’s no going back (also, thanks to Costco, it’s totally affordable). However, there are certain recipes where you want to see the little black flecks of vanilla beans. Ice Cream, for example. Or creme brulee. Vanilla Bean Paste gives you all that, without the work of having to cut and scrape the vanilla bean. Vanilla Bean Paste is basically a thick syrup that acts as a host for all those tiny, delicious, bursting-with-flavor vanilla beans. Here in Vancouver, I got mine at The Gourmet Warehouse, for about $7. I’ve been using it in everything! But testing it on these seemed like a good place to start. Michael, by the way, pronounced these “better than Starbucks.” Take that! In a small bowl, combine the milk and the vinegar or lemon juice, and let sit for a couple of minutes. In the bowl of your food processor, dump all the dry ingredients. Turn it on just for a minute, to mix. In the bowl with the milk, add the egg, vanilla, and vanilla bean paste. Mix with a fork to beat up and incorporate the egg. With the motor running, add the chunks of butter one at a time. The end result will be pea-sized chunks. Still with the motor running, slowly add the milk/egg/vanilla mixture until it forms a solid ball. Remove from the food processor to a well-floured workspace, and knead. You’ll know the scones are the right consistency if they are still a little wet, but not so tacky that they stick to your hands. Add more flour and knead in by hand if needed. Roll out into a large rectangle, and either use a cookie cutter or a glass to cut out rounds, or use a pizza cutter to make squares or triangles. 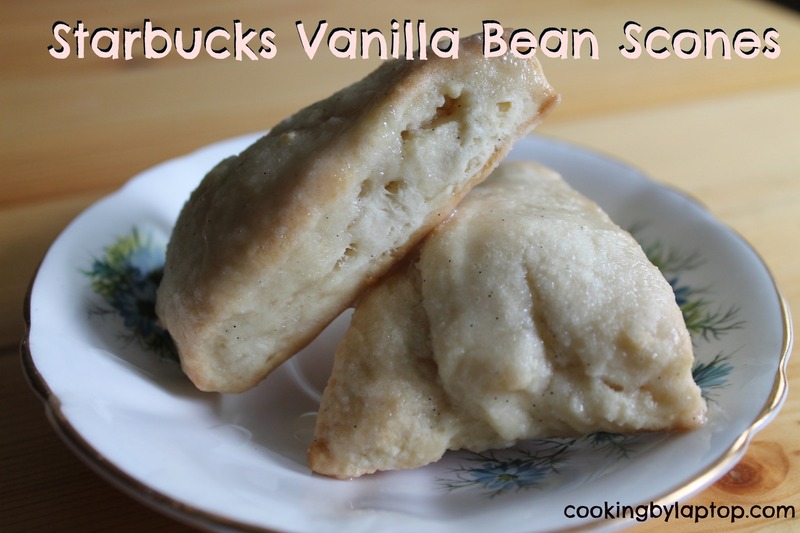 Arrange on a parchment-lined baking sheet, and bake at 400 for 14-20 minutes, depending on the size of your scones. I made mine smaller, so a shorter baking time was in order. Once cooled, mix up all the ingredients for the glaze in a shallow bowl. Pick up the scones by their bottoms, and dip their tops into the glaze, then place on a wire rack overtop of a cookie sheet to catch the drips. Serve plain, or with your favourite preserves.